For all that was written and said about the Gatwick drone incident, one little anecdote kept coming back. Time and again. The story of bald eagles. Why? As the journalists were busy rubbing their chins and racking their brains, wondering how best to deal with the problem of rogue drones, you might legitimately have asked, whether they were suffering from a case of, well… bird brain. Bald eagles are, quite literally, eagle-eyed. They can spot drones (as well as rabbits) at a distance of 5 km. Thanks to top speeds of up to 160 km/h, they can chase down their prey at lightning speed. 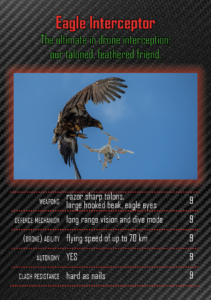 And when they go in for the kill, their swooping skills and razor sharp talons are perfect for snatching nefarious drones out of the sky. This picture from a Dutch Police trial proves just how effective bald eagles can be. 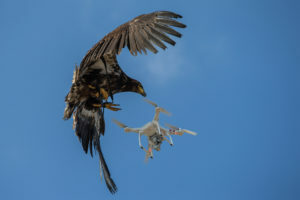 Yet the intensive bird-breeding and training programme which would be required to do this at scale, means that it would take time and major investment for the eagle solution to grow wings. This is not, however, to dismiss ornithological inspirations completely. Birds and insects have always been a point of reference for inventors in their quest for flight. The Ancient Greek myth of Icarus and Daedalus is a case in point. The father and son’s escape plan from imprisonment at the hands of King Minos, involved constructing wings of wax and feathers. Legend has that Daedalus flew successfully from Crete to Naples, only for his son to tragically fall to his death. The story goes that Icarus flew too close to the sun, melting the wax. The tragic ending to the myth serves to keep us humans grounded. Flight is in the gift of birds and insects; but for humans to take flight, requires ingenuity. When it comes to flight design, nature has a head-start of several million years. Still, humans have some advantages. As Kevin van Hecke, drone researcher at Delft University of Technology, points out, we have access to sophisticated materials and modern manufacturing techniques, which give us freedom to experiment and build flying machines at scale. I spoke to Kevin to find out more. Kevin continues: “Other times, simply mimicking nature does not work because we lack the same base materials. Which is why we humans spent a long time flapping wings until the Wright brothers finally realised we could use a propeller (something that Nature doesn’t have) and fixed wings to glide. The Micro Air Vehicle Laboratory, where Kevin works, is adorned with examples of such bio-inspired drones. On the wall, a gigantic poster shows the DelFly Nimble, which recently made the front cover of the journal Science. This tiny tailless insect-like drone has won international accolades, not only for its innovative way of flying but also for its role in helping scientists better understand fruit flies in flight. Across the room a carbon-black bird-like drone, dubbed RoboSwift, has got its beady eyes (and cameras) on us. Kevin picks it up and enthuses about the student-designed surveillance drone, inspired by the common swift (incidentally, this is Kevin’s favourite bird, which “spends almost its entire life in flight, apart from when it nests”). The bio-inspired drone can fold its feathers backwards, thereby changing its wing area, sweep, slenderness and camber. 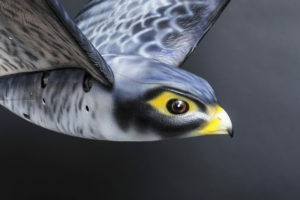 I am impressed by RoboSwift’s bird-like appearance, which gets Kevin talking about ROBIRD, a robotic bird of prey, designed by Dutch company, Clear Flight Solutions. 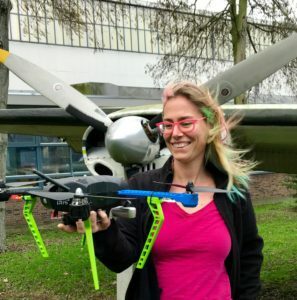 (Some of its engineers happened to be part of a DroneClash team in 2018). Its uncanny bird-like silhouette and wing movement is exploited to scare off unwanted birds around airports or farmers’ fields. Despite appearances, such bio-inspired drones are miles behind birds when it comes to autonomy. Today’s drones are still largely remote controlled and vulnerable to jamming and hacking. But all the signs are that drones will become more autonomous. Fast. Projects like the Medical Express Outback Challenge, are pushing drone designers to build intelligence into drones. It turns out, that bird brains, are just what future drones will need. Entries close January 31st 2019.